Below is a list of the vineyards we work with. Click on the vineyard name to explore each location. Carr Vineyards is a full service vineyard management company providing design and installation of new vineyards as well as consultation and revitalization of older vineyards. With 18 years of experience in the wine industry, Carr Vineyards knows what varietals grow well in the many different microclimates and soils of Santa Barbara County. Ryan Carr is the owner of Carr Vineyards and has hands on experience with growing grapes since 1998. In 2004 he established Carr Vineyards Inc. Carr Vineyards currently manages over 100 acres across Santa Barbara County. We pride ourselves on precision farming. Each vineyard is meticulously farmed to produce low yields, hand harvested and farmed using only organic practices. We work with each individual owner to create an irrigation design and select the best grape varietals suited for the property. If you are interested in planting a vineyard in Santa Barbara County, you can use the form below to tell us more about your needs. You may also contact Ryan Carr at 805-689-3569 or via email at ryan@carrwinery.com. 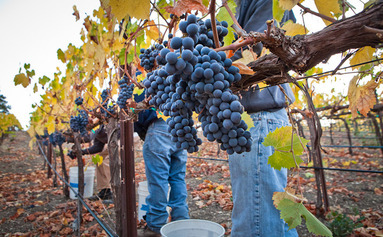 Carr Vineyards & Winery is a full service vineyard management company. How can we help you with your vineyard management needs?